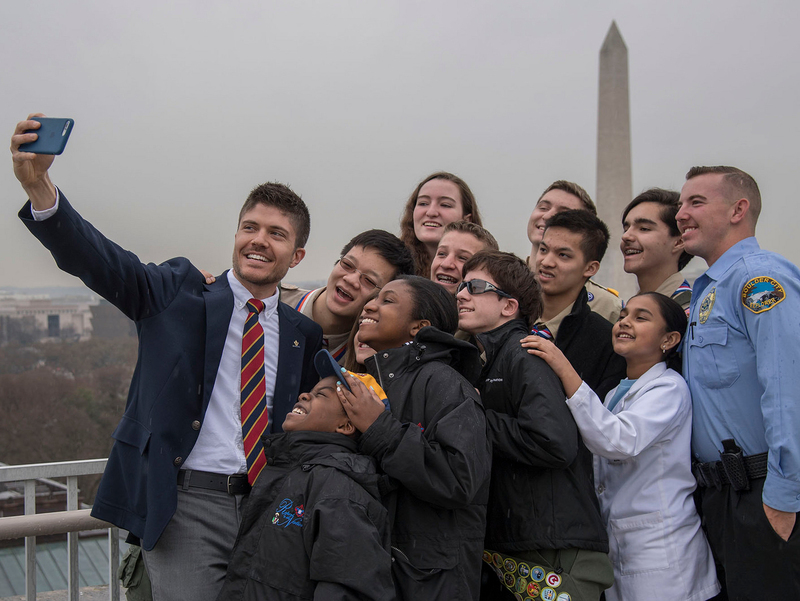 A Boy Scout from Washington, D.C., and a Venturer from Cincinnati were selected to join a leg of National Geographic Fellow Paul Salopek’s 21,000-mile walk around the world. Christopher Sherman and Miciah Thacker penned thoughtful essays reflecting on their experiences at Philmont and the 2017 National Jamboree, respectively. They then impressed the judging panel with stellar interviews. Both young people took Salopek’s call for “slow journalism” to heart. They paused to observe and appreciate the little details of life. As of this writing, Salopek is in Pakistan — more than 5,000 miles in. He regularly posts fascinating stories to this page. This awesome opportunity doesn’t end with Christopher and Miciah. Anyone who participates in a Philmont Trek or a Summit Bechtel Reserve program in 2018 and writes an essay about their experience will be eligible to be selected to join Salopek on a similar trip. Scouts and Venturers can learn more at those high-adventure bases when they visit. Before you learn more about Christopher and Miciah, I must give props to the folks who made this possible. First, the Pulitzer Center. They started working with Philmont in 2014 and provided an incredible experience for Boy Scout Nick Fahy of Milton, Mass., in 2016, when he wrote a winning essay and was selected to join Salopek in Uzbekistan. In 2017, the stakes got even bigger. Salopek encouraged tens of thousands of Scouts at Philmont and the 2017 Jamboree to slow down and reflect on their experiences. Traveling overseas isn’t cheap, and this latest opportunity was made possible by the Pulitzer Center and because of the generosity of the Philmont Staff Association and the Summit Bechtel Reserve Staff Association. The associations invest and provide incredible support for not only the staff, but for the overall mission of both high-adventure bases. Christopher Sherman, a member of Boy Scout Troop 52 of the National Capital Area Council, wrote an essay about his life-changing Philmont experience. The 16-year-old shared how his Philmont trek helped him grow as a person. “I look forward to introducing the younger Scouts in my troop, and others, to the possibilities inherent in simply spending time alone and together in nature,” Christopher wrote. Miciah Thacker (right), a member of Venturing Crew 5257 of the Dan Beard Council, was selected from 2017 National Jamboree entrants. The 16-year-old wrote how the Jamboree helped her connect with people from a variety of backgrounds. Christopher and Miciah were selected for this globe-trotting adventure because they slowed down to think about their Scouting experiences and put those thoughts into a 500-word essay. Slow journalism is about taking time to observe what’s around you. It’s about paying attention to the little details of life. It’s about appreciating everyday interactions. Salopek invited Scouts and Venturers to write 500 words or less about their National Jamboree, Philmont and/or Scouting experiences. Those essays were then assessed by the Boys’ Life and Scouting magazine teams, volunteer and professional staff from the Jamboree and Philmont, and the Pulitzer Center Education Team. Once the top essays were identified, Miciah and Christopher worked through a competitive interview process, during which they provided evidence that they had adopted concepts from the Out of Eden Walk in their Scouting experiences and everyday lives. You can read Christopher and Miciah’s winning essays here. It wasn’t all about the essays, though. Interviews with finalists were what ultimately determined the winners. Judges asked about their curiousness, interest in the walk and how much they’d internalized the lessons of intentionality. I’ll share stories from Christopher and Miciah after their trip to India. Anyone who participates on a Philmont Trek or a Summit Bechtel Reserve program in 2018 will be eligible for a similar opportunity. Learn more here. Look for more Scouting testimonials from the Philmont and Jamboree Out of Eden Walk essays throughout the year.